Nick Miller (b 1962, London). Graduating in Development Studies from the University of East Anglia, he moved to Ireland in 1984 to pursue painting. Working first in Co Clare, then in Dublin, since 1992, he has been largely based in Co Sligo. 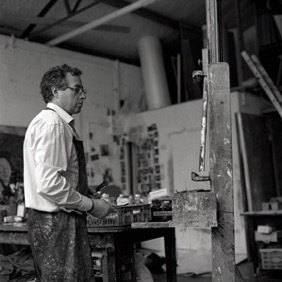 Elected as a member of Aosdána in 2001 in recognition of his contribution to Arts in Ireland, he is the recipient of the inaugural 2014 Hennessy Portrait Award at the National Gallery of Ireland. Miller has exhibited widely including solo shows at The Irish Museum of Modern Art, the RHA and the New York Studio School. In 2017 he was guest curator of the RDS Visual Arts Awards exhibition in Dublin. "Rootless | new paintings", Art Space Gallery, London, (Feb-March 2019); "Rootless", Oliver Sears Gallery, Dublin, (Oct-Nov 2018); "Vessels: Nature Morte", Art Space Gallery, London (Sept-Oct 2016); "Nick Miller and the Studio of Edward McGuire", Irish Museum of Modern Art, Dublin (Nov 19th, 2015 - May 2nd, 2016); "Vessels: Nature Morte" RHA Gallery, Dublin (2015). “Sitting” Laois Arthouse, Stradbally, Co Laois (2014);”YARD" Rubicon Gallery Dublin (2012); "Painting Patrick: after Olympia & Venus" The Heritage Council, Kilkenny Arts Festival; "Tree House 360˚ "Concord Art Association (2011) Concord, MA, USA. Curated by OH Projects, Boston;"Tree House 360˚" Rubicon Gallery Dublin (2010) "Truckscapes - Paintings from a mobile studio" New York Studio School, New York (2008) "Truckscapes- Drawings from a Mobile Studio" Centre Culturel Irlandais, Paris (2007), Limerick City Gallery of Art, Limerick (2008), Rubicon Gallery, Dublin (2008); "Standing Sitting Lying: Watercolours" Rubicon Gallery, Dublin (2006); "Genre", The Butler Gallery (2004), The Castle, Kilkenny ; "Figure to Ground", Royal Hibernian Academy, Dublin (2003); "Closer" Rubicon Gallery, Dublin; Art Space Gallery, London (2000-01); Kilkenny Arts Festival; "Paintings & Drawings" Rubicon Gallery Dublin (1998); Art Space Gallery, London (1999); "Figure", The Lowe Gallery, Atlanta USA (1996); "Paintings", Fenderesky Gallery, Belfast; (1996) "South African Works", The Irish Museum of Modern Art Dublin (1994); "Paintings & Drawings", Galerie D’Eendt, Amsterdam (1992) and "The Shadow Line", The City Arts Centre, Dublin (1991); "Zoo Work", Eve Linders, Dublin (1989); Twilights Raw, Project Arts Centre, Dublin (1988). In 2002 he curated the visit to Ireland of Chinese artist Chen ZhongSen including amongst other events a joint exhibition "Chen + Miller : East + West" at The Model Arts and Niland Gallery, Sligo. National Gallery of Ireland, Irish Museum of Modern Art, Dublin City Council; The Hugh Lane, Irish Life PLC, RTE, The Arts Council (Ireland), European Investment Bank (Luxembourg), Independent Newspapers (Ireland), The National Drawing Collection : LCGA (Limerick Municipal Collection), The Niland Collection (Sligo), Ballinglen Arts Foundation, Boyle Civic Collection, Fujian Teachers College (China), Dublin Institute of Technology, Allied Irish Bank, Irish Permanent, Ulster Bank. Fundacion Privada Sorigue, Lleida Spain.